Updates to Tiffany's profile since your last visit are highlighted in yellow. 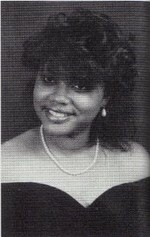 I attended the University of Southern Mississippi from 1989-1993. I then attended Jackson State University for both my Master's and Doctorate degrees. I have for the last 10 years been employed with Hinds Community College in several capacities. I have one son, Eddie, who is 14 years old and married a guy from Arkansas. I now reside in Byram. Tiffany Anderson Chanay has a birthday today.